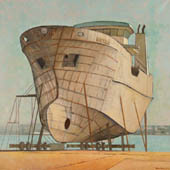 Mary Ann Runciman’s Boat Paintings Often Depict Working Boats. 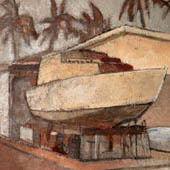 Boat Paintings Feature Sparkling Water Reflections of Their White Hulls. 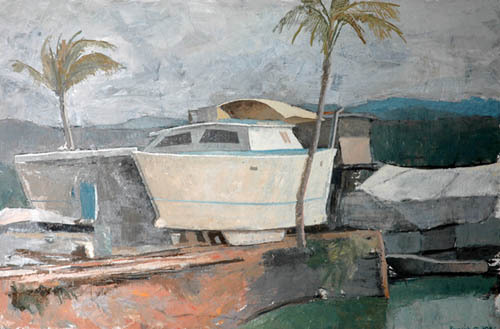 Mary Ann Runciman’s boat paintings are part of what she calls her Escape Series, a period in her career where she left behind the confines of city living and travelled to Tropical North Queensland to explore the way of life in the small resort town of Port Douglas. 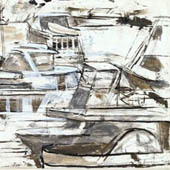 Mary Ann considers that the marina, boat, industrial landscapes and landscapes in general, owe a lot to her brief architectural training and time spent drafting in architects’ offices in university holidays. She has always enjoyed the challenge of geometry and of spatial problems. 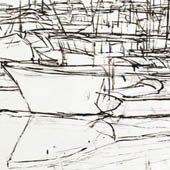 She comments that "The boat and marina paintings offer the delightful perspective problem of no (or few) straight lines. 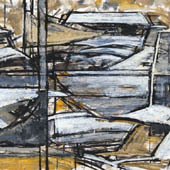 The marinas are a chaos of clutter and spatial overlapping. It is always more interesting to attempt the seemingly impossible. 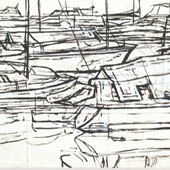 Boats have natural, organic shapes. I like to capture them, when possible, when they are fully exposed, out of the water, on the slipway 'hard stand' or 'shipyard'." 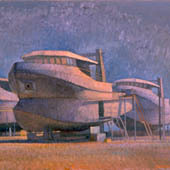 These paintings are part of the Escape Series - escape from the confinement of the square of the Confinement series and, of course, symbolic of escape, travel and freedom. The Confinement Series was done during a period of restriction in Mary Ann's life. 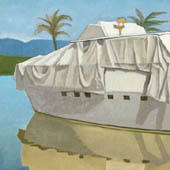 Most mornings, at first light, Mary Ann can be found at the inlet or marina in Port Douglas, North Queensland, working on boat paintings before her subject 'up anchor' and sail away for a day on the Great Barrier Reef. 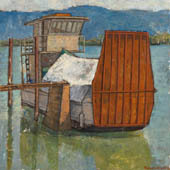 It is natural that she would meet many of Port’s seafarers, Port Douglas characters, who work on the boats that she paints. 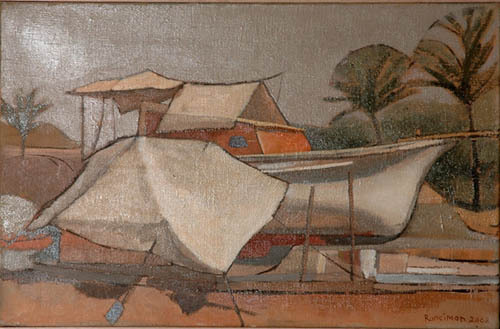 Her paints and canvases are never far away so it is a logical step that oil portrait paintings of these engaging subjects, as well as their boats, form the basis of her tropical paintings. 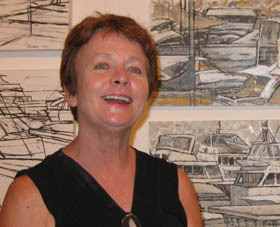 In fact, for a year or so, on visits to Port Douglas, Mary Ann used to live on a boat moored in the inlet, just a short walk away from her studio hideaway. She now divides her time between her home-town of Adelaide in South Australia, a studio in Paris and her latest love, Port Douglas in Tropical North Queensland.